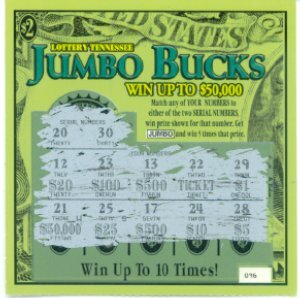 Jumbo Bucks seems to be the lottery version of a landed gentry legacy family. 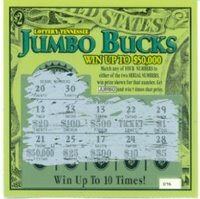 There's the $1 Junior Jumbo Bucks, this $2 Jumbo Bucks game I tried today, and the $5 Super Jumbo Bucks which the helpful counter clone told me was brand new and no one had won anything from it yet. Still didn't get me to part with the Linc to pick it up, but maybe later. Game Play: Match one of two "serial numbers"